Indianapolis, IN - The members of the Sump and Sewage Pump Manufactures Association (SSPMA) elected a new slate of officers and directors at their 2019 Spring Meeting held on February 22nd in Indianapolis. The Board will serve from 2019 - 2021. (Right) Deron Oberkorn was presented with an appreciation plaque for his service as Board President from 2017-2019. Ryan Fickes, Ashland Pump; Jeff Hawks, Champion Pump; Mark Huntebrinker, Zoeller Company; Amy Rainer, Franklin Electric, Matthew Servant, Pentair Water, and Jay Orellana, TouchSensor Technologies, LLC (Associate Member Representative). ​SSPMA Announces Latest Certified Pump Listing which now includes Ashland Pump Co./Eco-Flo Products, Inc.
21 members gathers in Detroit Lakes, MN on August 21-22, 2018 for the SSPMA's Fall Meeting. Several industry issues were discussed as well as new educational outreach efforts. A member dinner was held (pictures below) on Aug. 21st where long time SSPMA member Loran Knudsvig was honored for his service and his pending retirement. The following day members toured SJE Rhombus and Alderon Industries. Special thanks to all who attended and to the member companies for their hospitality. 24 members gathered in Indianapolis, IN on February 23, 2018 for the SSPMA's Spring Meeting. Numerous topics were discussed focusing on education outreach to homeowners and contractors as well as the importance of the SSPMA Certification for pumps. 25 members gathered in Chicago, IL on October 3, 2017 for the SSPMA's Fall Meeting. Numerous topics were discussed focusing on education outreach to homeowners and contractors as well as the importance of the SSPMA Certification for pumps. ​SSPMA Welcomes New Member​ - See Water Inc.
Ryan Fickes, Ashland Pump; William Gell, Xylem; Randy Tucker, Franklin Electric, Matthew Servant, Pentair Water, and Joe Zimmerman, SJE-Rhombus (Associate Member Representative). Incoming SSPMA President Deron Oberkorn presents outgoing President Jeff Hawks with an appreciation award for his service as President from 2015-2017. SSPMA Welcomes New Member - Eco-Flow Products Inc. / Ashland Pump Company Inc. The SSPMA is pleased to announce the creation of it's own YouTube Channel featuring a few of the associations past videos recently published on the channel in support of the SSPMA mission's education component. Click here to access the new channel! The WWETT planning staff recently announced that there will be a 5 session SSPMA Education Track incorporated into their 2016 Show in Indianapolis. The SSPMA educational sessions will be presented throughout the day on February 17, 2016 culminating with a general Q&A with presenters. SSPMA is pleased to work closely with the Water and Wastewater Equipment Treatment and Transport (WWETT) show to further the educational goals of the association. A draft of the session topics, summaries, and bios may be accessed by clicking here. The SSPMA Fall Meeting will be held in Chicago, IL with the member networking reception on Tuesday Sept. 29th and meetings on the morning of Wednesday Sept. 30, 2015. Please mark your calendars and plan to attend!. Our reception and meetings will be held at the Inn of Chicago, 162 East Ohio Street, in downtown Chicago. SSPMA has secured a block of 10 rooms at a rate of $159 per night. Members may reserve a room by calling 312-787-3100 and referencing the SSPMA Fall Meeting in order to secure the discounted rate. Complete registration information will be sent out prior to the event. Stay tuned! 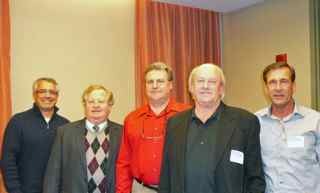 Past President: Mark Huntebrinker, Zoeller Co.
William Gell, Xylem; Jeff Goodenbery, Liberty Pumps; Deron Oberkorn, Zoeller Co.; Kent Ralston, Superior Pumps and Joe Zimmerman, SJE-Rhombus (Associate Member Representative). The members of the Sump and Sewage Pump Manufactures Association (SSPMA) elected a new slate of officers and directors at their 2015 Spring Meeting held on February 26th in Indianapolis. 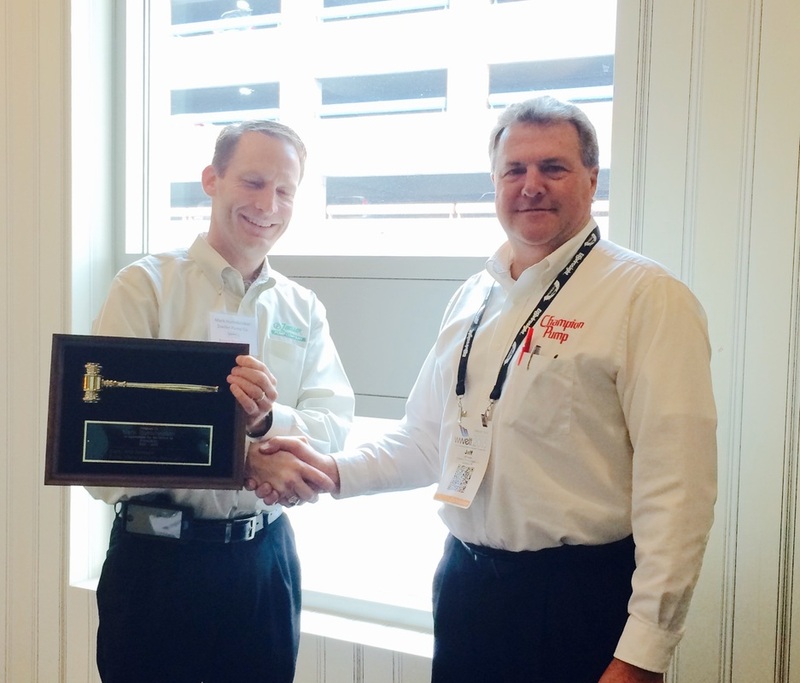 Mark Huntebrinker was presented with an appreciation plaque for his service as Board President from 2013-2015. Registration is now open for the 2015 SSPMA Spring Meeting! INDIANAPOLIS, IN — The SSPMA Spring Meeting will be held in Indianapolis, IN on Wednesday February 25th with an all new member networking reception on Wednesday Feb. 25th and meetings on the morning of Thursday Feb. 26, 2015. Please mark your calendars and plan to attend! Our meetings will be held at the Marriott Indianapolis Downtown, 350 West Maryland Street, which is also one of the designated special rate hotels for the WWETT Exhibition. No special SSPMA room rates are available. INDIANAPOLIS, IN — The Sump and Sewage Pump Manufactures Association (SSPMA) has been selected to provide a three track educational session at the Water & Wastewater Equipment, Treatment & Transport (WWETT) Show on February 23, 2015. 1) "Sizing Guidelines for New or Replacement Sewage Pumps", presented by Deron Oberkorn who is the Corporate Product Development Manager for the Zoeller Company. 3) "Specifying Pumps / Why Do Pumps Fail?" presented by Jeff Hawks, President of Champion Pump Company, Inc.
SSPMA Members... Register Now for SSPMA's Fall Meeting in New Orleans! INDIANAPOLIS, IN — Please register and join us on September 30/October 1, 2014 in New Orleans for the 2014 SSPMA Fall Meeting! The Member dinner will be held at 5:30 pm at the Red Fish Grill on Tuesday September 30th followed by the Member meetings on Wednesday October 1st at the Astor Crowne Plaza. The Marketing and Technical Committees will be meeting from 8:00 – 9:30 am (Local Time) and the General Member meeting will be held from 11:00 – 12:30 pm. Our guest speaker will be Matt Winkelman, PE, Sr. Civil Engineer, GHD. Mr. Winkelman will be speaking on his white paper covering lessons learned from construction of a new pump station on an existing pump station including layout and basic hydraulics of the station. Registrations should be submitted to the SSPMA by Friday Sept. 12th. Contact SSPMA's Office for information. Phone: (317) 636-0278 or Email: hdqtrs@sspma.org. INDIANAPOLIS, IN — The Sump and Sewage Pump Manufacturers Association (SSPMA) recently elected the following officers and directors to a two-year term: President, Mark Huntebrinker (Zoeller Co., Louisville, KY); Vice President, Jeff Hawks (Champion Pump, Ashland, OH); and Secretary-Treasurer, Scott Stayton (Franklin Electric/Little Giant, Oklahoma City, OK). Directors elected were Charlie Cook (Liberty Pumps, Bergen, NY); Linda Kerdolff (Wayne Water Systems, Harrison, OH); Jill Boudreau (Goulds Water Technology, Seneca Falls, NY); and John Evans (Motor Protection Electronics, Apopka, FL). Susan O’Grady (Pentair Water, Delavan, WI) remains on the board as past-president. NORTHBROOK, IL — The Sump and Sewage Pump Manufacturers Association (SSPMA) has hired Blake R Jeffery, CAE of Blake R. Jeffery Inc., Indianapolis IN, to serve as its managing director. Mr. Jeffery replaces SSPMA’s managing director of 39 years, Pamela Franzen of Nike Professional Services, who has retired from association management. Mr. Jeffery has 13 years of association management experience. Prior to working with associations, he was director of environmental affairs with the Indiana Manufacturers Association and has lobbied for the Indiana Chamber of Commerce. He brings more than two decades of local and state legislative agency, lobbying, public affairs and management experience to the associations he serves. SSPMA’s new office will be headquartered in Indianapolis, effective April 1, 2013. SSPMA's Sewage Pump Sizing program to provide CEU's at IL PHCC Expo March 22nd. NORTHBROOK, IL — The Sump and Sewage Pump Manufacturers Association (SSPMA) welcomed Superior Pump as a new member. They are located in Minneapolis, MN and manufacture sump, sewage, effluent, utility and back-up pumps. SSPMA represents the manufacturers of sump, sewage and effluent pumps, together with component and accessory suppliers. For more information, refer to SSPMA’s web site at www.sspma.org, email: hdqtrs@sspma.org or phone 317/636-0278. NORTHBROOK, IL — The Sump and Sewage Pump Manufacturers Association (SSPMA) held its Spring Meeting in late February in Indianapolis, IN. All pump company members were represented at the well-attended meeting, The program featured four plumbing contractor representatives who are members of the Indiana Plumbing Heating Cooling Contractors Association. SSPMA members submitted their questions in advance, providing for a lively discussion. Among the topics discussed were plumbing industry trends, pump distribution, training and education needs for employees, time demands for handling service calls and other concerns or recommendations from the contractors and pump and accessory manufacturers attending. SSPMA represents the manufacturers of sump, sewage and effluent pumps, together with component and accessory suppliers. For more information, refer to SSPMA’s website at www.sspma.org, email: hdqtrs@sspma.org or phone 317/636-0278. NORTHBROOK, IL — The Sump and Sewage Pump Manufacturers Association (SSPMA) has released a free, downloadable, PowerPoint presentation covering Sizing Guidelines for New or Replacement Sewage Pumps on the SSPMA website. Included with the step-by-step outline are printed worksheets and charts for calculating a sizing problem. Subjects covered are: Pump Capacity, Total Dynamic Head, Solids-Handling Requirements, Basin, Simplex or Duplex System? and a Sizing Example. This free presentation is available in either PowerPoint version or .pdf version. 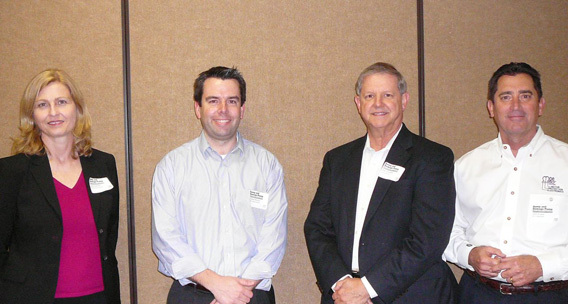 SSPMA held its Fall Meeting in late September at Metropolitan Industries in Romeoville IL. The SSPMA member company provided an overview of their various products and projects, involving pumps, controls, and ancillary equipment, covering the municipal, commercial, HVAC, industrial and residential water and wastewater industries. A tour of their “green” energy and water independent facility in a nearby housing on their campus was included. Nearly all pump company members were represented, as well as most component member companies. Featured at the General Meeting was the unveiling of two major new projects: (1) a new training program for sizing sewage pumps, including a working calculation example which can be downloaded for use with the program and (2) an upgraded, newly designed SSPMA website. The training program was developed for members of the plumbing industry who work with sewage pumps. NORTHBROOK, IL — The Sump and Sewage Pump Manufacturers Association (SSPMA) welcomed three new member companies this year: pump manufacturers Glentronics, Inc. (Lincolnshire, IL) and Wayne Water Systems (Harrison, OH); and components manufacturer Motor Protection Electronics (Apopka, FL). Representatives from new SSPMA member companies are, from left to right: Linda Kerdolff, director of marketing at Wayne Water Systems; Charles Murphy, vice president of sales at Wayne Water Systems; Alan Schulman, owner of Glentronics, Inc.; and John Evans of Motor Protection Electronics. 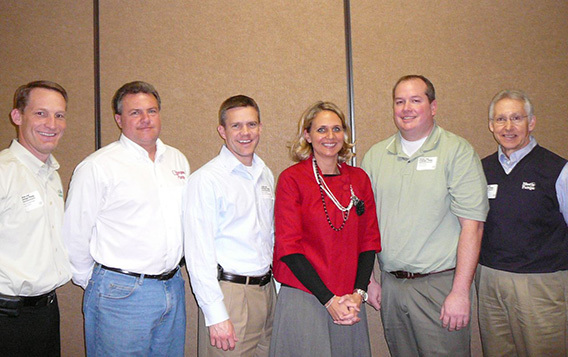 NORTHBROOK, IL—The Sump and Sewage Pump Manufacturers Association (SSPMA) recently elected the following officers and directors to a two-year term from 2011-2013: President, Susan O'Grady (Pentair Water, Delavan, WI); Vice President; Mark Huntebrinker (Zoeller Co., Louisville, KY); and Secretary-Treasurer, Jeff Hawks (Champion Pump, Ashland, OH). Directors elected were Charlie Cook (Liberty Pumps, Bergen, NY); Scott Stayton (Franklin Electric Water Transfer Systems, Oklahoma City, OK) and Greg Simon (Alderon Industries, Hawley, MN). Nike Professional Services provides management services, with Pamela Franzen serving as Managing Director. SSPMA officers and directors are: left to right, Vice President Mark Huntebrinker; Secretary-Treasurer Jeff Hawks; Director Scott Stayton; President Susan O’Grady; and Directors Greg Simon and Charlie Cook. NORTHBROOK, IL — The Sump and Sewage Pump Manufacturers Association (SSPMA) reported significant sales increases for 2010. The increases for each of the product categories for which the Association collects statistics are: pedestal and submersible sump, sewage and effluent pumps (+10 1/2%); utility pumps (+42%); battery-operated backup sump pumps (+19%; multi-stage centrifugal effluent pumps (+24 1/2%; and submersible grinder pumps (+32%). NORTHBROOK, IL — A training video, "Effluent Pumps for Onsite Wastewater Treatment: Selecting the Right Pump for the Job", is available from the Sump and Sewage Pump Manufacturers Association (SSPMA). The educational video is intended for onsite contractors, engineers, government regulators, research academics and trainers in developing ways to make it easier to successfully match the equipment to the job. The 28-minute video, along with accompanying work materials, deals with the sizing and selection of an effluent pump for a particular application. Specifically, the presentation takes the viewer through the selection process for two of the more common systems — enhanced flow septic tank pumping and low-pressure pipe distribution. However, the principles governing pipe size, pump selection and control settings can be applied to other applications as well. To order a copy, along with one set of the worksheet materials, which can be duplicated for classroom use, send check or money order (sorry, we don't accept credit cards) for $45, U. S. funds to SSPMA, P. O. Box 46244, Indianapolis, IN 46244. Discounts apply for quantities of two or more.